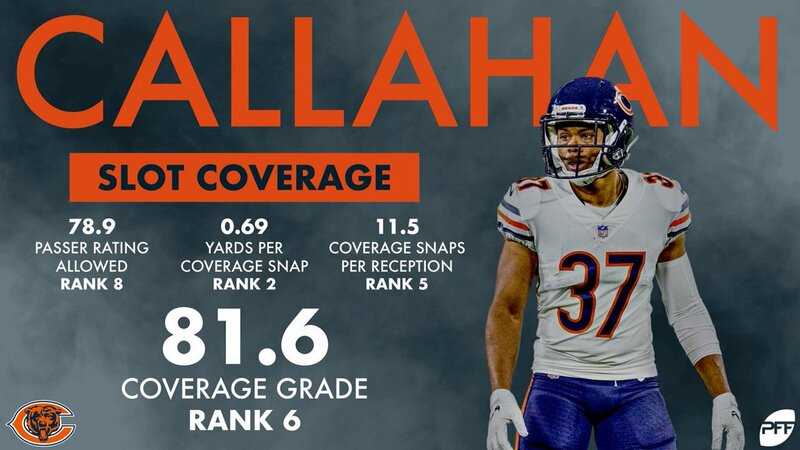 Cornerback Bryce Callahan churned out a career-best season in a contract year with the Chicago Bears, which is an athlete’s dream. It earned him a lucrative three-year, $21 million contract with the Denver Broncos, who — aside from Chris Harris Jr. — were battered and bruised through the air in 2018. It was a season far from emblematic of a unit once called “The No Fly Zone,” but with Callahan’s addition, the Broncos could be headed for another rendition in 2019. Callahan joins proven stud Harris Jr. and former first-round pick Kareem Jackson in the cornerback group. 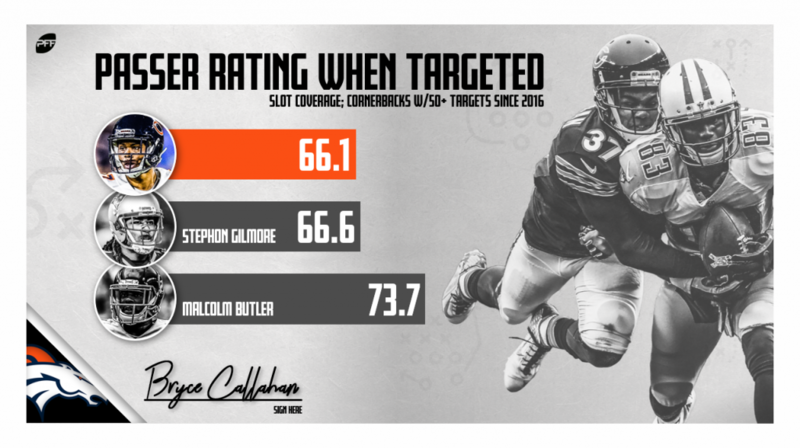 While Harris Jr. was the Broncos’ primary slot corner this past season, Callahan should be able to take over that role and let Harris line up more on the outside against bigger threats. As an undrafted free agent, Callahan was thrown into the fire his rookie year, facing 33 targets but holding his ground with no touchdowns allowed, and that effort earned him a respectable 64.5 overall grade. In 2018, though, he displayed a prowess that was matched by few in the NFL. En route to an 81.4 overall grade that ranked 10th among cornerbacks, Callahan allowed just 8.2 yards per reception in the regular season (fifth) and was dominant in the slot. In yards per snap allowed from the slot, Callahan ranked first at 0.69 yards, while Harris Jr. joined him in the top-five, ranking third. And opposing quarterbacks clearly took notice of Callahan’s skillset, as he was targeted at the lowest rate based on snaps played. But the question is, does Callahan bring this defense to another level? Cornerback Bradley Roby, who signed with the Houston Texans, gave Denver 900-plus snaps this past year and safety Darian Stewart was recently released. Now, the Broncos will rely on Callahan from the slot and Harris Jr. and Kareem Jackson on the outside. Back in 2015, the No Fly Zone’s inaugural year, the Broncos allowed just one 300-yard passer; that feat likely won’t be topped in today’s even pass-heavier NFL, but there is potential for a lockdown secondary to form. Callahan and Harris Jr. were both top-10 in yards per reception allowed in 2018, and Jackson was top-50. Honing in on Callahan’s season in the slot provides some interesting insights into just how valuable he could be for the Broncos. Callahan notched eight contested passes from the slot in 2018, while the Broncos ranked only 20th as a team in the category as a whole. That opens the door for a more aggressive secondary in 2019. Speaking of aggressiveness, Callahan faced four deep targets (20 or more yards downfield) from slot coverage in 2018. He allowed none of them to be completed and contested three of them. The Broncos as a team were average against the deep ball last season, so Callahan’s addition certainly provides some optimism that the unit can reach further heights. A secondary that was once considered the league’s best quickly fell from grace after carrying the team to a Super Bowl victory in 2015. But with a remodeled offense as well as a remodeled defense, the new-look Denver Broncos could turn a few heads come 2019 — and they’ll have their hands full with Antonio Brown bringing his talents to the AFC West division.